*	The upbeat spirit in which all is done! The groove is GrooveQuest's foundation. It is strong, warm, lively, happy, communicative, supportive, respectful, highly exuberant, and inspirational--to band and audience alike. The band members (gentle human spirits/talented team players) support one another in interactive, harmonious, authentic, impassioned musical self-expression. GrooveQuest songs are carefully chosen, vibrantly alive, rhythmically enriched, and abundantly soulful. The arrangements encourage the musicians to creatively stretch out and spontaneously express their musical passions. The overall effect of a GrooveQuest performance--on an audience--is a contagious, highly-charged shared feeling of pure joyousness! Steve O'Brien (vocal, guitar) is blessed with a natural rich singing voice and musical ear. Steve is infatuated with blues, R&B, soul, and folk music--its founders, proponents, and overall culture. He is continually expanding his repertoire and stylistic technique to best communicate the spirit-filled message of each tune. Lisa O'Brien (bass) possessing a natural solid rhythm timekeeping sense, Lisa offers driving danceable grooves coupled with a naturally supportive team-player approach that mixes with an extraordinary stage presence, filling band stand and venue with a radiant karmic glow. 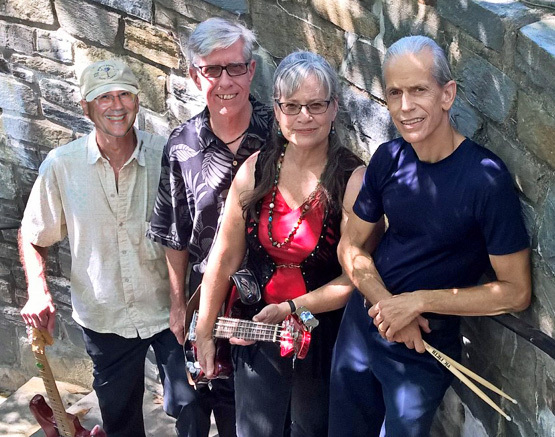 Steve and Lisa have been performing in the Washington DC area for over 20 years in various configurations including the Revelators, the Other O'Briens, Takoma Crossing, and now, GrooveQuest. They perfom as a duo and serve a co-leaders of GrooveQuest. Drummer/vocalist Jimmy Proctor delivers for you! We're so fortunate to have Jimmy keeping us honest...and laughing! Check back soon for more info! Lead Guitarist and Keyboardist Rick Aurich is GrooveQuest's "double threat," adding to the sonic vitality with tasteful solos and licks. He teaches as well! His performance credits include Slimman and The Nowhere Men. See our memorial thoughts here. RIP, Great Friend. Al Steele (guitar) is experienced in a variety of musical genres. He studied music at the University of Pittsburgh. He refined his jazz improvisation skills with the prominent saxophonist Nathan Davis. Al played rock, folk, country, bluegrass, and jazz in various Pittsburgh-based bands. Moving to the DC area, Al performed with Jazzmatics, a jazz quartet and Nightwork, a classic rock and blues band. While in the Navy, Al was a guitartist for the USS America Jazz Band. Al was GrooveQuest's lead guitar player 2004 through 2016. Drummer/vocalist Joel App grew up in a musical family in Bethesda, MD, and has been drumming and singing professionally since age 14. He has performed, toured, recorded locally, nationally, and internationally with such diverse artists as Southern Wind, John Harbison, Jack Bond, Bill Holland, Johnny Castle, Cathy Ponton King, Ron Holloway, Scott Ambush, Bob Margolin, Dave Chapell, Bill Kirchen, the Zealots, and national television and concert performances with Wammy Award winning Ruthie and the Wranglers. Lead Guitarist Allen Mosenkis complimented GrooveQuest's youthful exuberance and respectful maturity. We're grateful to have made music with him in 2017. Gene Meros (sax/flute) What's R&B without a great sax? Gene's solos, fills, and monstrous tone bring smiles to faces all night long. He's been a pro since age 12 when his father formed and led "The Meros Brothers" which included Gene's brothers, of course, and his sister. They were a busy polka band, and their exploits include competing on the Ted Mack's Amateur Hour television show. A lengthy 1990 article in The Music Monthly describes another phase of Gene's illustrious career. Read the article here. Dave Johnson (keys/guitar/vocals) GrooveQuest is always pleased to expand whenever possible to include Dave, a fabulous and active performing, recording, and touring musician. through the Groove to You!